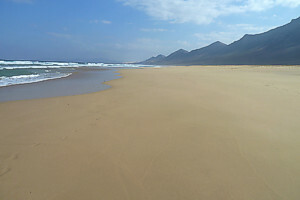 Cofete Beach. Places to visit in Fuerteventura. It's good to book one of your vacation days to visit the most famous virgin beach of all Canary Islands: Cofete. It is a place that impresses because of its size, for the wilderness that surrounds it. In addition to an incredible beach over 12 Km. 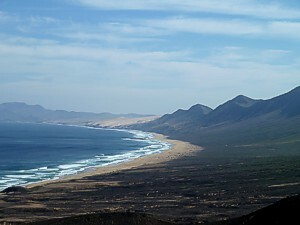 in length, can also enjoy the mountain massif of Jandia (with the highest mountains of Fuerteventura), which protects the entire beach to the east, the Islet, an island connected to the beach, Roque del Moro, a giant rock in the sea placed vertically, of the mysterious House of Winter, or the small town of Cofete, with its fish restaurant, your veranda and small exhibition hall on the site. 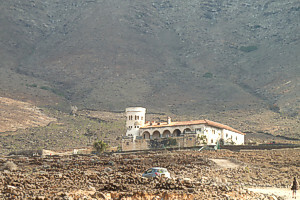 To reach Cofete, we take the road from the village of Morro Jable (and near the Marina),and is indicated (COFETE - THE PUERTITO). Following this path, (which in some places his condition is bad), and 8.5 Km., find a detour to the right (COFETE). From this point, the road climbs into the mountains and is very winding and the pavement is not good. About 2 Km, we reached the Overpoint Degollada Water Sheep, where we have an impressive overview of Cofete. From here, follow the path down to the village of Cofete making sure, it is a narrow road that runs in his first installment on a cliff. In the first section, we observe the typical plant of Fuerteventura, El Cardon, a type of cactus, which is protected. When you reach the small town of Cofete, we can go see the Winter House (watch the way it is easy to get stuck), a walk in the house Cofete, or downloaded directly to the beach, where we find ample parking (next to a picturesque little cemetery). From this point, or we can walk along the beach to the north and visit the islet (5 miles and approximately an hour's walk), or go south and reach the Roque del Moro, which is truly impressive (2, 7 km). Taking a long walk on this beach is one of the best experiences you can have in Fuerteventura. It should be borne in mind that the sea in Cofete is extremely dangerous with strong currents, so that the bath should be done in a prudent manner, even in summer when it appears that sea conditions are right. It is advisable to make this visit in a 4x4 car, but it can be done with a normal car, with caution.